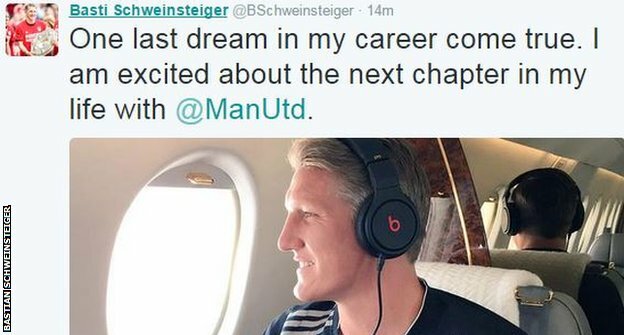 Bastian Schweinsteiger has thanked Bayern Munich fans as he has a medical on Sunday before his proposed move to Manchester United. The 30-year-old Germany midfielder is believed to have told Bayern he did not want to extend his contract, which runs until 2016. United announced in a club statement on Saturday that they had reached an agreement to sign him. "I hope you understand my decision," Schweinsteiger told fans on Twitter. The World-Cup winner said he was moving to United to "gain experience at a new club". "No one can take away the incredible journey we had together. The decision was very hard to make because you and Bayern have, are and will always be an extremely important part of my life," he added. 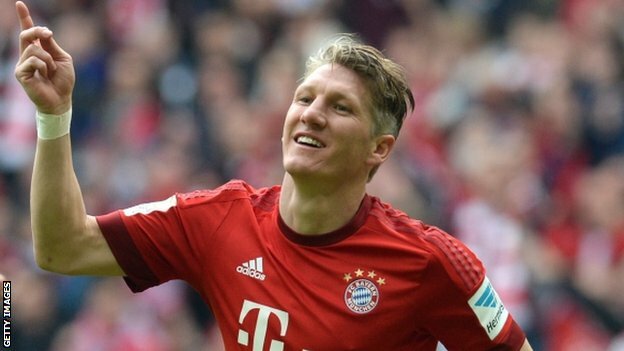 The Old Trafford club hope to complete the medical to enable Schweinsteiger to be involved in their tour of the US. Louis van Gaal's men fly out to America on Monday afternoon and will be based in Seattle for their first game against Mexican team Club America on Friday. Bayern's chief executive Karl-Heinz Rummenigge said: "It's regrettable because Bastian meant a great deal to the club. "He achieved great things but he wants to do something new at the end of his career. He asked that we meet his wishes." Schweinsteiger has made 536 appearances for Bayern since his debut in 2002 and played under Van Gaal while the Dutchman was in charge at Bayern between 2009 and 2011. He helped his country win the 2014 World Cup and has one Champions League, eight Bundesliga titles and seven domestic cup triumphs to his name while at the German club. Bayern defender and former German captain Philipp Lahm said: "We have to simply respect and accept his decision. He's looking for a new challenge, but for me it's an absolute pity he is going." United identified Schweinsteiger earlier this summer as a high-profile player they were interested in, along with Real Madrid defender Sergio Ramos. Rihanna Announces New Line of Designer Socks!